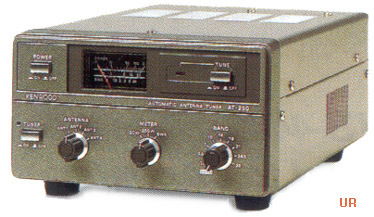 The Kenwood AT-250 automatic antenna tuner covers the HF ham bands from 160 through 10 meters (including WARC). It has an AC power supply built in plus DC terminal. The built-in SWR/Power meter indicates peak power on SSB, average power in other modes and does not require calibration adjustment. Four separate sets of antenna terminal are provided. Through power is 100W (200W PEP). Insertion loss is less than 0.9 dB. Maximum tuning time is 15 seconds. Physical: 6.85 x 3.78 x 10.1 inches 9.26 Lbs. (174x96x257mm 4.2kg). The AT-250 is a great match for the Kenwood TS-140S.